Indonesian authorities have raised alert levels for a volcano on the country’s resort island of Bali. 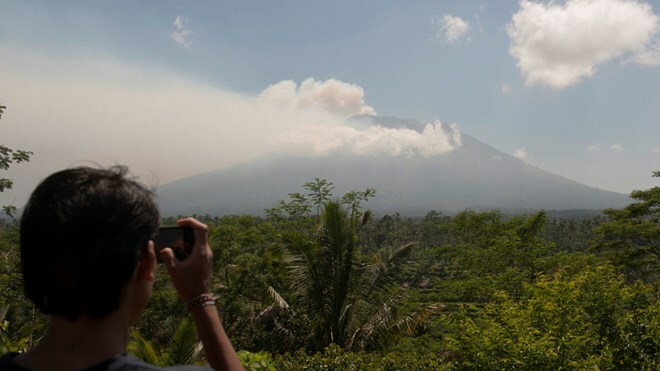 Jakarta (VNA) – Indonesian authorities have raised alert levels for a volcano on the country’s resort island of Bali after hundreds of small tremors triggered fears that it could erupt for the first time in more than 50 years. 7.5 kilometres of its summit. No volcanic ash has been seen spewing from the crater. But hundreds of small tremors have rattled the mountain in the past two days, forcing about 350 people to evacuate to safer places. Willem Rampangilei, head of Indonesia's National Disaster Mitigation Agency, warned that the community must remain vigilant as up to 480 tremors have been recorded. The airport on the resort island, a top holiday destination that attracts millions of foreign tourists every year, has not been affected but its authorities are keeping a close watch on volcano developments.